From 1967 eighteen-year-old Susanna Kaysen spent two years at the famous McLean Hospital (of Sylvia Plath fame) in a psychiatric ward for teenage girls after a short session with a psychiatrist she’d never seen before. 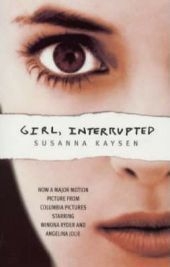 Girl, Interrupted (first published in 1993) is a memoir of her time there and told in a series of short non-chronological vignettes in which we, and Kaysen, slowly try and piece together the events that led to her spending so long at McLean and get a portrait of life in this strange and sometimes disturbing environment. ‘People ask, how did you get in there?’ writes Kaysen. ‘What they really want to know is if they are likely to end up in there as well. I can’t answer the real question. All I can tell them is it’s easy. It is easy to slip into a parallel universe. These worlds exist alongside this world.’ The book ruminates on society’s definitions of what constitutes sanity or insanity with Kaysen herself, despite her circumstances and location, sometimes feeling like a sane person in an insane world. The non-linear structure – a sort of Scenes From A Psychiatric Ward if you will – affords us a window into this troubling world and allows us to meet some of the other notable occupants of Kaysen’s ward. Chief amongst these is the obstreperous Lisa who Kaysen says still makes her smile whenever she thinks about her now all of these years later. Lisa has a penchant for daring escape attempts but is usually returned again a few days later after disappearing. ‘The worst was that she was always caught and dragged back, dirty, with wild eyes that had seen freedom. She would curse her captors and even the tough old-timers had to laugh at the names she made up.’ Lisa is the most vivid of the people Kaysen met in the hospital and features in the memoir quite a lot. Although diagnosed as a sociopath and very loud and unpredictable, Kaysen also remembers Lisa as a funny person who kept their spirits up and – stuck with apparently permanent insomnia from her drug-addled past – someone who would slowly calm down and decompress late at night and make hot chocolate for the staff at unearthly hours. One thing I found interesting too were Kaysen’s musings on the possible motivation for respectable and well-heeled families of the era to shove their dysfunctional children away in one of these places. Kaysen seems to suggest throughout the book that it simply makes them feel better to isolate the troubled one in the family. ‘Most families were proving the same proposition: We aren’t crazy, SHE is the crazy one. Those families kept paying.’ If I had any criticisms of the book the first would be that it’s a tad too short at only 167 pages and perhaps a little pretentious on fleeting occasions, especially a two or three page segment on Velocity vs Viscosity (‘Paradox. The tortoise and the hare. Achilles and the what? The tortoise? The tendon? The tongue?’) where Kaysen seems to be trying too hard to impress. The escapades and foul-mouthed insults of the patients are also perhaps never quite as amusing as Kaysen probably thinks they are. These quibbles aside though, Girl, Interrupted is always fascinating for the glimpse it affords us into this strange secret world and is often a very poignant book as we read about these troubled souls. Overall I would recommend Girl, Interrupted. Although disturbing at times this is an eloquent and very personal memoir that is well worth reading. No Comments on "Girl, Interrupted"